On May 16 2015, 1000s of Ghanaians took to the streets to protest the energy crisis in the country, otherwise known as Dumsor. The government’s failure to solve a three year problem has crippled businesses, claimed lives and continues to hinder the economic growth of the west African country. 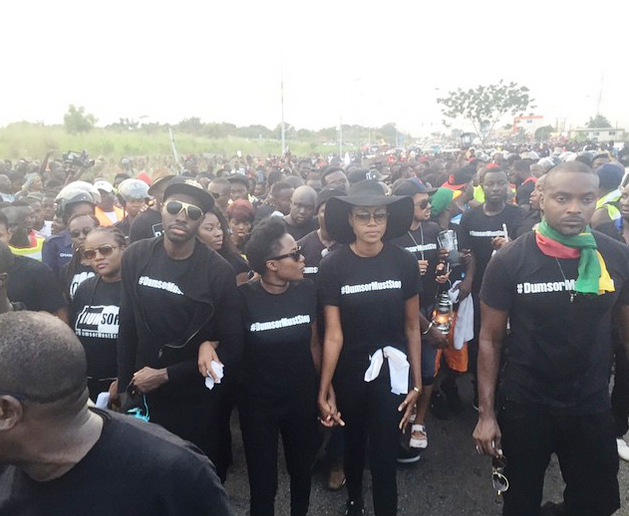 The Dumsor vigil was led by actress Yvonne Nelson and her celebrity friends, who were joined by Ghanaians from all walks of life; academics, students, civil servants and even street hawkers, who swapped their sim cards and water sachets for anti-government placards. The word Dumsor is a portmanteau of the word Dum (to turn off) and So (to turn on) in the Akan language of Ghana. So a roundabout translation would be on-and-off. Now, I want you to think of all the times in your life that you’ve described something or someone as on-and-off. My on-and-off girlfriend, on-and-off diarrhea, an on-and-off toothache… doesn’t sound like much fun does it? 1. Did I care? Like really care. 2. Were any of my friends there? 3. Would this end up on the Daily Mail? The answer to 2/3 of them was no. When I saw a tweet about a Dumsor vigil in Accra, I paid little attention to it. When a few days later, my newsfeed was filled with a #DumsorMustStop hashtag, accompanied by images of thousands of Ghanaians marching, it was a bit more difficult to ignore. According to news site Joy Online, the vigil pulled one of the biggest crowds (none of my friends were present) ever recorded in Ghana for any form of demonstration. The cause, or causes of Dumsor are many, but generally when a country goes through a crisis, it’s those in power that get the blame. In this case, the president John Mahama and his NDC party. Is it his fault? No, not really. Can we blame him? Yeah, kind of. An electricity crisis has plagued Ghana for decades, while two different parties have been in power. It’s not a Mahama problem, it’s a Ghana problem. But he is running the country at the moment, and until the media can shift the blame onto ISIS, he’ll have to remain the guilty party. 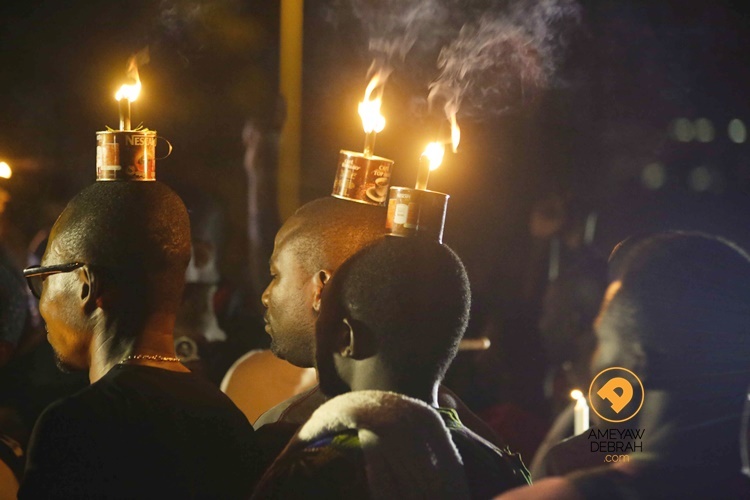 The Dumsor vigil was organised to raise awareness about the negative impact of the crisis, show citizens that the constitution of Ghana allows and empowers them to let their voices be heard, and most importantly, to remind Ghanaians not to accept the current power crisis as the norm. Because it’s not normal and neither are its side effects. The Dumsor crisis has given birth to a new wave of creatives; photo editors, App developers and wordsmiths who have done well to remind us that there’s always a light at the end of the tunnel. And it can be downloaded at an App Store near you. Technology start-up Kode Fusion GH created the Dumsor App, essentially a phone torch for Android devices. Future updates of the Dumsor App include an ECG Load Management schedule, where users are notified of when there will be a power outage in their area, as well as an automatic flash-light which switches on based on the schedule. It has been downloaded between 10 and 50 thousand times to date. 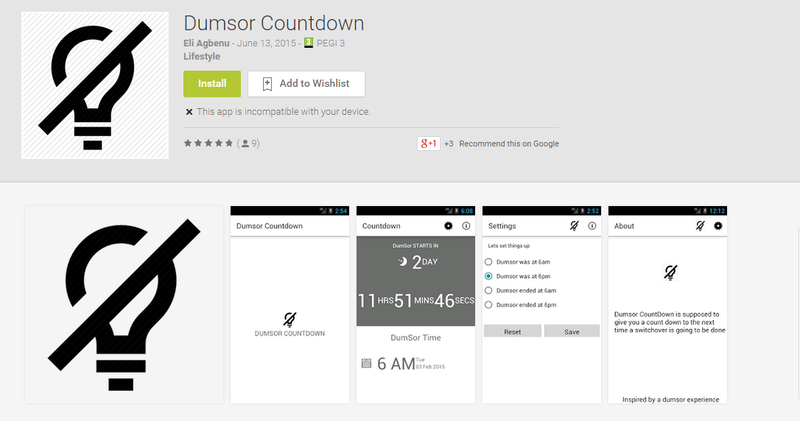 There’s also a Dumsor Countdown App, so you can organise your life around the load shedding schedules. Another Dumsor App reminds users to iron their clothes and charge their phones before the lights go out. But Dumsor is no laughing matter. It cost Ghana between Ghc320 million and GHc924 million (£136M) in 2014 and currently costs Ghana $2.2 million a day according to the institute of statistical, social and economic research. The irregular power supply, is forcing many companies to downsize. And not just small and local companies; Cadbury Ghana and Coca Cola have also had to let people go. Obviously a major frustration is the heat. There’s no escaping it. You can’t keep food in the fridge or freezer because it spoils, life support machines fail in hospitals. And then there’s the deaths. The three babies who reportedly died in a eastern region hospital, the man who fell off a rooftop where he was sleeping because he couldn’t turn the aircon on in his house, and the couple who died from gas inhalation after switching on their generator during the night. And when people die, their bodies are left to rot in mortuaries that can’t turn on their refrigerators. Walk into a labour ward and you have women giving birth by mobile phone light. So the first thing some babies see when they enter the world is a phone. Which is fitting, seeing as Ghana sits on the mobile continent. Not with a vigil. Firstly, you don’t organise a vigil to tackle an ongoing and nationwide crisis, you start a protest or a march or even a riot. A vigil brings to mind pictures of weeping mothers holding up candles and pictures of their murdered sons. Or a convent of nuns celebrating the Resurrection of Jesus. Where’s the petition? The website offering ‘How to Survive Dumsor’ tips, official Twitter account? Facebook, Instagram? Who’s selling T-shirts and where can I buy them? Will the sale proceeds from Sarkodie’s Dumsor single go to families most affected? 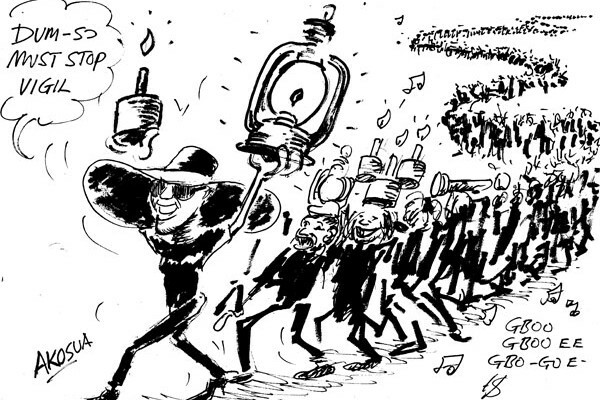 What are people actually doing apart from tweeting a hashtag and walking down the street with kerosene lamps? It’s been a month now, the next steps have to be a bit more detailed than Yvonne saying: ‘My team need to sit down and plan the next thing that we want to do’. And where are Ghana’s lawyers? Come out of your chambers and tell people what can and can’t be done, launch a class action against the government, do some TV and radio interviews, pretend you care. The most disappointing aspect of this vigil and the subsequent ones in other Ghanaian cities was their duration. If change doesn’t happen overnight, it certainly won’t happen after a few hours spent walking down the road. Speaking to hundreds of youth at an event organised by Occupy Ghana in Takoradi last month, the Paramount Chief of the Western Nzema traditional area, Awulae Annor Adjaye III, encouraged Ghanaians to ‘stay in the streets for one month’ if they really want to make a difference. You want to make a revolution and want to address Dumsor and you take one day to the streets and you think it will be solved? It can’t be solved! If president Mahama can’t fix it and you want to show him that he can’t fix it, stay in the streets for one month; don’t go home, don’t sleep, don’t eat, die in the streets – that is revolution. He went on to call the vigil organisers ‘jokers’, and not the good type of joker the girls used to call Darnell back in school, the bad type. Sometimes I just laugh when people talk about Dumsor, Dumsor and then they go to the streets for one day. You people are jokers. You go to the streets one day and you come back… you think you can solve the problem? You can’t solve any problem with this type of arrangement… stay in the streets for three months and I will support you. You are not committed to doing what you have to do and you talk about Dumsor, you’ll sleep in the darkness till doom’s day. There is a simple solution to Ghana’s electricity crisis, a centuries old, rather logical solution: Solar energy. Ghana is well placed to take advantage of the sun’s energy, and solar is being used, just not on a large enough scale. Unsupportive regulatory environments, lack of technical capacity and a weak supply chain are some of the reasons solar energy is not being exploited in Ghana. Since Nkrumah introduced the country and the continent’s first hydroelectric dam in 1965, it has been the main source of electricity in Ghana for over four decades. And by not diversifying, not being forward thinking and depending mostly on the power generated by hydroelectric dams, it’s no surprise the country is in this state. Then come the overdue initiatives like the Nzema Project and Mahama’s pledge to provide 200,000 homes and micro enterprises with solar power. Great news, but a little too late. Additionally, when you have politicians and wealthy businessmen building petrol stations all over the place, they’re hardly going to promote solar energy, let alone invest in it. 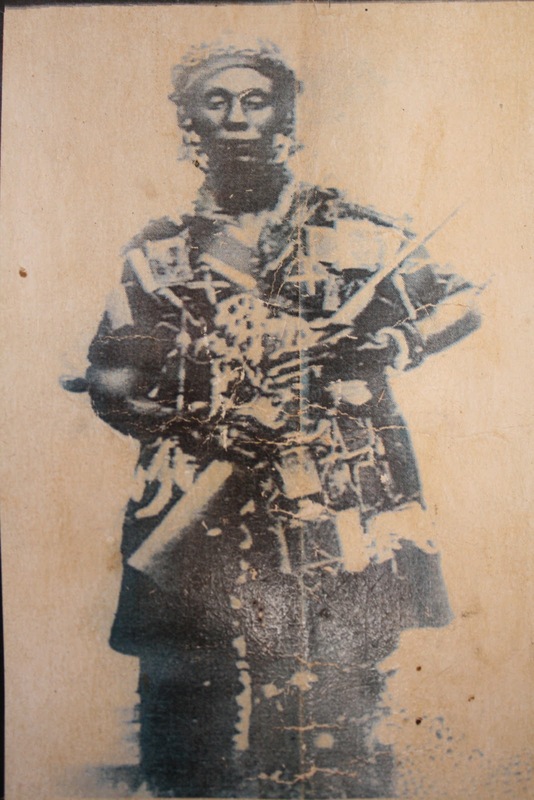 Yaa Asantewaa is a huge name and it’s really humbling that anyone would call me Yaa Asantewaa. As a matter of fact, I love it. Let me put it in there Yvonne Yaa Asantewaa Nelson so that’s like my new name right now. Which is a better name than some of the other ones she’s been called thanks to the vigil, like a prostitute, an electricity thief and more recently, a fire starter. Another person Yvonne has been compared to is Akon. 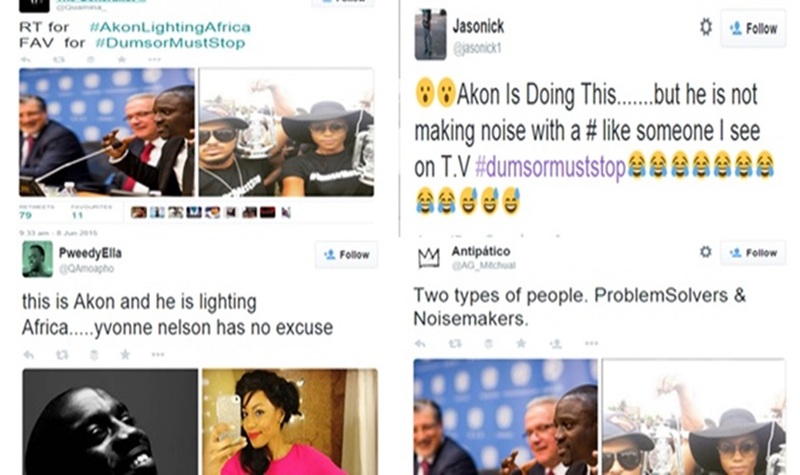 If you missed the news about what Akon has been doing in Africa, you’re not alone. As US rapper Snoop pointed out, the media would rather us talk about a white man in drag, than someone who is changing the world. Last year Akon, political activist Thione Niang and entrepreneur Samba Bathily, launched Akon Lighting Africa, an initiative that aims to ‘electrify a million households across the continent’. The initiative expands to 14 African countries, including Nigeria, Kenya, Madagascar and Senegal, where Akon is from, and is providing street-lamps, solar micro-generators, household electric systems and jobs for young people in the areas where the project has been introduced. Pretty amazing right? In fact you’ve probably forgotten about the thing that what’s her name done last month already. The Power Minister, Dr. Kwabena Donkor has reassured Ghana that Dumsor will end in December. And if it doesn’t, he will resign. It would be nice to assume that Yvonne Nelson and her vigil have something to do with this. But we all know that Ghanaians have short memories, and as soon as the problem is solved by this president or the next, we will clap our hands for him as if he has done us a favour, praise him; our parents will stick pictures of him on their walls and children will be named after him. Will anyone be named Yvonne Nelson? Will a young woman in the future be called the ‘Yvonne Nelson of the 22nd century’? Only time will tell.